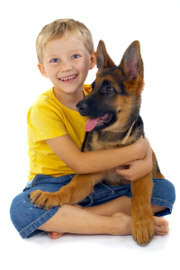 Throughout history Man has demonstrated his love and bond with animals. He has shown them the same respect in their passing, by writing loving epitaphs and creating Cemeteries and Memorials, specifically to remember beloved Pets and Animals. 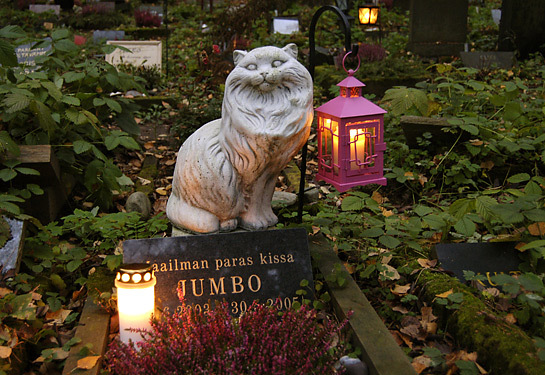 These Pet Cemeteries and Memorials can be found throughout the World. Many date back hundreds of years and some are more recent; but they are all a touching tribute to the humans bond with their unique and beloved pets, and can be places for quiet contemplation. Some animal lovers enjoy visiting Pet Cemeteries, walking around the graves and reading the headstones with their poignant words. This can be very comforting, also therapeutic and they say gives them inner strength. It is heartwarming to realise that people of years gone by, felt the same about their own pets as we do today about ours. Thousands of years ago the ancient Egyptians & Pharoahs had their Pets buried with them. Kings and Queens have remembered faithful pets with lasting monuments, and touching epitaphs have been written praising long lost animals. This goes to prove that Animals forever hold a Special Place in our hearts. Now with the onset of Technology we hope to continue this tradition of paying Tribute to beloved Pets with our online Remembrance Gardens. This cemetery dates back to the 1920's and holds over 3,000 animals. 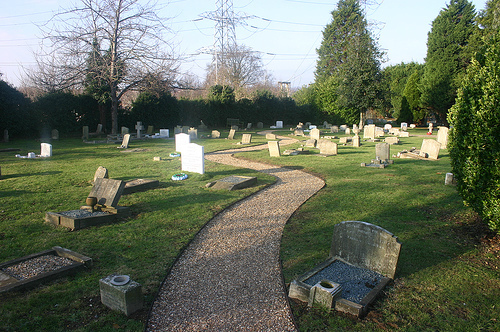 In 2006 the Cemetery was renovated and where needed headstones were restored or replaced. The garden provides quiet contemplation for all animal lovers. It was designed to reflect the colours of the PDSA Dickin Medal ribbon; green, brown and blue for the sea, land and air forces. Many well known animals are buried here, it is the final resting place for 12 animal heroes from WWII. Each hero was awarded the PDSA Dicken Medal which is the Animal equivalent to the Victoria Cross. Guided tours of the cemetery are available. Hyde Park contains a pet cemetery at Victoria Gate, Bayswater road. Established 1880 at the back of Victoria Lodge. By 1893 there were 33 gravestones. The last burial was in 1967. Sadly it is now apparently forgotten and overgrown and there is no access. There is a small garden which has been used since the 1840's to bury the remains of officers pet dogs and also regimental mascots. As the castle is a fortress it was for periods of time, during battle, completely cut off from the rest of the world. So it was deemed neccesary to have a burial place for dogs. It is said one of the dogs still haunts the castle. On guided tours of the castle the burial ground can only be viewed from above. Set in ten landscaped acres it is the final resting place for over 40,000 animals. The park was founded and dedicated on September 4th 1928. A brick Mausoleum was erected in 1929. Hopalong Cassidys horse 'Topper' and Rudolph Valentinos dog 'Kabar' are both buried here. The family of Dr Jones operated the park for over 40 years. In 1973 the family graciously donated the cemetery to the Los Angeles SPCA. After 10 years LA SPCA considered selling the site to developers. A group of pet owners heard of this and formed S.O.P.H.I.E (Save Our Pets History in Eternity) A non profit public group dedicated to the preservation of this Pet Sanctuary. They managed to purchase the grounds and lobbied at the State Legislature in Sacramento for the first- ever state law to protect Pet Cemeteries. It is open for visitation every day of the year. Americas oldest Pet cemetery. Founded in 1896. Dr Samuel Johnson a veterinarian offered his apple orchard to serve as a burial plot for a bereaved friends dog. That single act of compassion marked the beginning of a beautiful hillside cemetery. 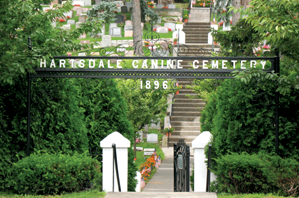 Now a century later it is the resting place for over 70,000 pets. It also houses the War Dog Memorial, erected in 1923 for canines who served in the military. Since 1915 the remains of 50,000 animals are buried here including, dogs,cats and chimpanzees. Buried alongside them all, in 1964, is President Nixons cocker spaniel Checkers, who saved his career in 1952. There are plots large enough to accomodate multiple burials and the cemetery will transport animals. There is also a private viewing room where owners can say goodbye to their pets. The most famous pet cemetery in Lisbon. Situated on a terraced hillside inside the zoo grounds .For local people to bury their beloved pets. There are many tombstones here, mainly in white marble, dedicated to beloved pets. Founded in 1998 in the Bohnice neighbourhood of Prague 8. Part botanical garden and pet cemetery holding 2,000 graves. Beautiful calm place created with no concret nor asphalt. 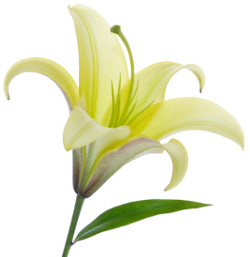 Each owner can chose a tree or ornamental wood to be planted on their pets grave. Interred here includes former Presidents Vaclav Havel's schnauzer and Jiri Paroubek's basset hound. On 24th August 2007, in response to demand, a collaboration between Moscow city government and private investors, opened a Pet hotel, Veterinary Clinic, visitor centre and Moscows first Pet Cemetery. The centre stands on two hectares of land with space for 30,000 pets. 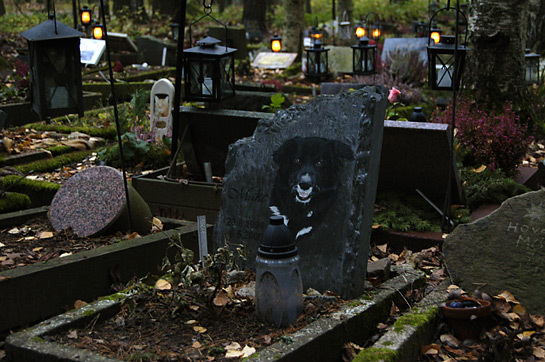 The Pet Cemetery has proved very popular with Russian Pet owners and many have sought its service. Cats, Dogs, horses, parrots and even hamsters have made their last resting place amongst its hand carved tombstones. Founded in 1899 in response to a law passed which stated dead pets could no longer be thrown out with the household garbage!! Situated on the river at asnieres sur Seine, next to Pont de Clichy bridge. Officially called Cimetiere des Chiens or Cemetery of Dogs, it actually houses cats, hamsters, sheep, rabbits, chickens, mice , fish, a horse and even one lion. There's also an entire section reserved for police dogs. 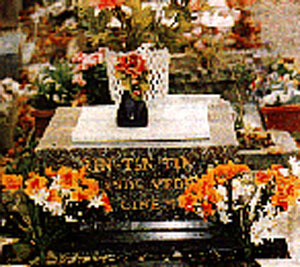 Over 40,000 pets are buried here, including, possibly, the most famous of them all RIN TIN TIN. The cemetery is also home to a large number of stray cats and there is a small house at the back they call their own. Metro Manila,Katipunan Valley, Loyola Heights, Quezon City, PHILLIPINES. When the Philipine Animal Welfare Society opened a rehabilitation centre in 2001, many owners enquired about a place to bury their pets. So PAWS opened a memorial space for pets. Apart from a common grave site where animals are buried, there is also a memorial wall inscribed with the words "Gone but not Forgotten". Underneath are tiles where owners can leave messages for their beloved pets. Small ledges enable candles and photos to be left. Pet owners are asked for a minimum P500 for the cemetery to provide a grave and give a short service. Donations for the burials help support the animals at PAWS shelter. An attractive Pet Cemetery south of Metsolantie. The cemetery was opened in 1947. 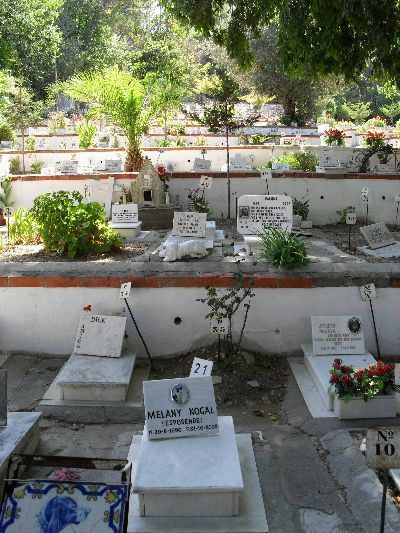 There are 3000 small graves of pet animals such as dogs and cats. Larger dogs and pets are cremated and reside in urns. A charming of this cemetery are the free standing lanterns on individual gravestones, which makes this a must, for an after dark visit. A woodland set cemetery being the final resting place where dogs, cats rats, birds, rabbits and fishes are all next to each other in harmony. There is a striking large central monument of a pets collar, which is in memory of all lost animals gone to "Other hunting grounds" The entrance is an imposing artistic and distinctive archway. In Japan, dogs and cats are considered, even in death, to be part of the family unit. There are at least seven pet cemeteries within the Tokyo metropolitan area. On an average weekday 250 - 300 people visit the graves. The main reason they give for visiting is they worry that their pet will be lonely. A Buddhist temple built in 733, set aside a section, in March 1962 for Pet Graves. The Ancient Egyptians kept many animals as household pets, including, cats, dogs, horses, monkeys, gazelles and birds. Some were given elaborate burials by their grieving owners. Although a few were killed when their owner died to accompany them on their journey to the afterlife, pets were also placed in the owners tomb at a later date after a natural death. 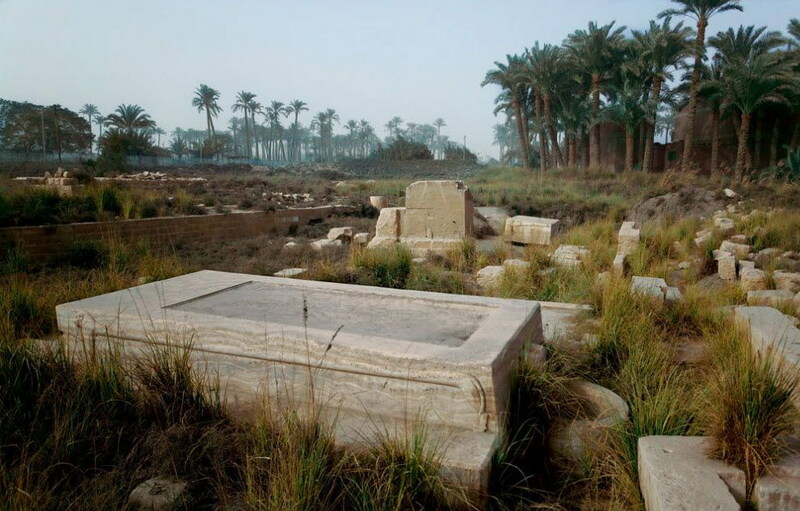 During the 1st Dynasty, 2950BC (5,000 years ago) Kings were buried at Abydos with their pet dogs, donkeys and lions. A limestone sarcophagus was commissioned in the 18th Dynasty by Royal Son and Chief Artificer, Tithmose, for his pet cat, and was adorned in hieroglyphic text, the same as were used for humans. In the 30th Dynasty, approx 500BC, a commoner called Hapymen, was buried at Abydos with his pet dog curled at his feet. Archeologists have also discovered Shrews in boxes of carved limestone; Rams covered with gilded and beaded casing, Gazelles wrapped in papyrus; and Ibises in intricate appliques bundles. In Tomb KV50. An owner has placed his Pet Baboon and Pet dog facing each other for eternity. Some of the many animals interred here include; gazelles, shrews, cats, dogs, monkeys, horses, raptors, snakes, scarabs, ibises and crocodiles. Here is another cemetery including all the above species of animal plus lions and bulls. Established in 2005, this village Pet Cemetery became the third official one for Pet Owners to use in Poland. It operates under Polish law and is for small animals and pets. It consists of a large grassy bank, which is fenced and lies alongside the main S8 Bialystokand - Warsaw road. Urns and animal statues adorn the gravestones. 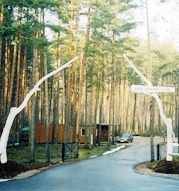 The first and oldest Pet Cemetery in Poland opened in 1991. It gave Polish Pet owners the chance to give their pets a dignified and lasting burial place. It is in a beautiful woodland setting. Transport to the cemetery for the animal can be arranged. A small private pet cemetery in the grounds of Haddo House. Haddo House is a stately home in Aberdeenshire now owned by The National Trust.